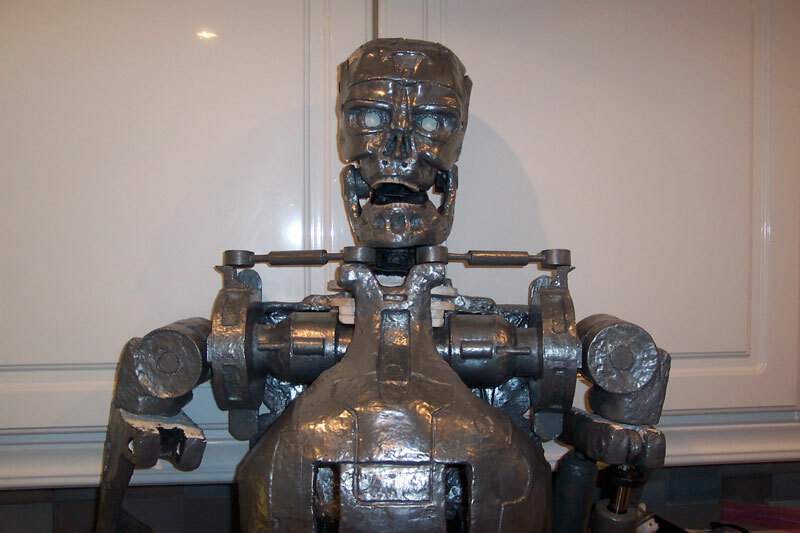 This is my personal project of an Endoskeleton build I did for a full stretch of 6 months back in 2003/2004. 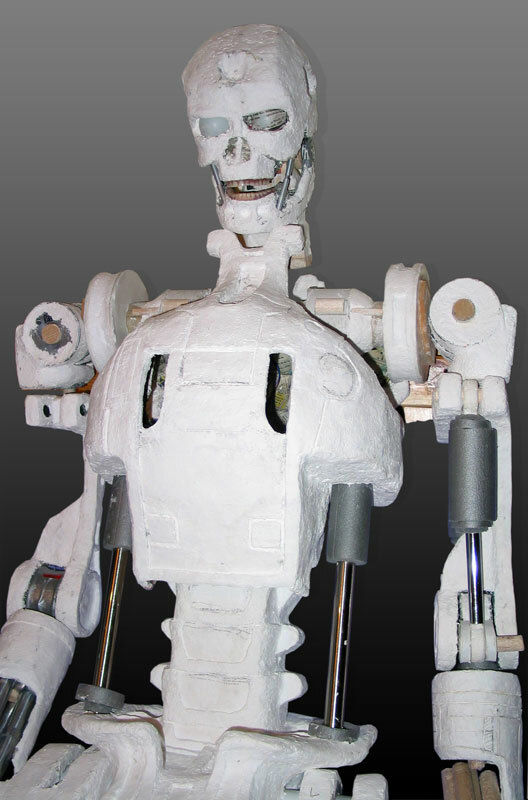 The model might look somewhat clunky compared to the shiny professional looking endoskeletons out there, but I think that might appeal to some fans anyway. I built the model with no particular end in mind, except for something to keep me busy. I never knew it was going to consume me for 6 months but it was well worth it! 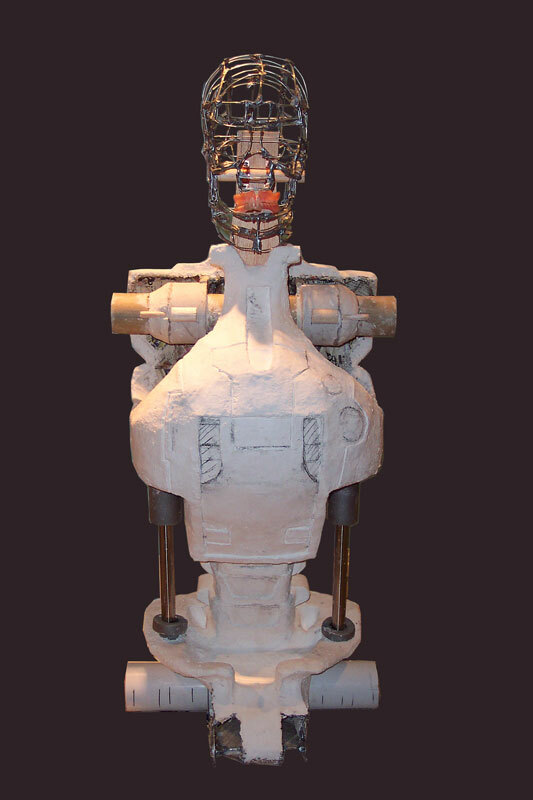 Like all artists they are never happy with their work, and if I were to do it again I would do it differently. However life is too short to go over old ground, so that's why I'm currently working on a 6ft+ Predator with the view to completing the treble with Alien at a later date. 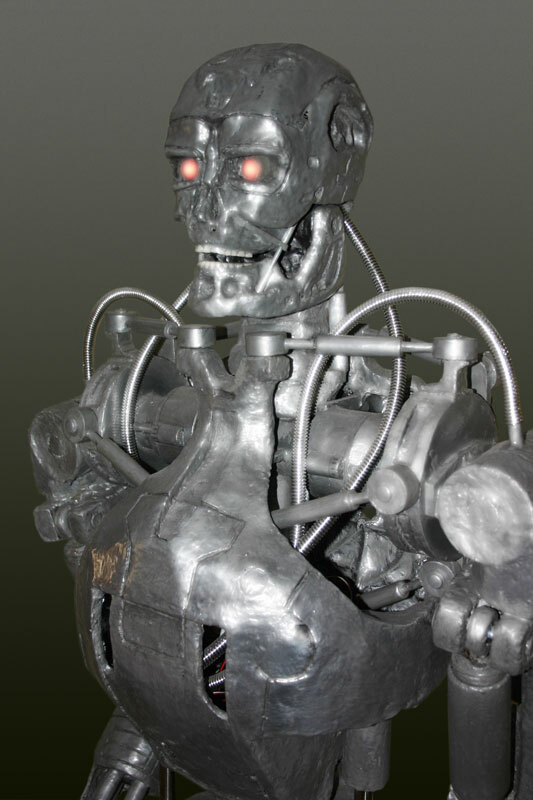 The Terminator model was last exhibited at WorldCom 2005 annual sc-fi convention in Glasgow, but it was not for sale. 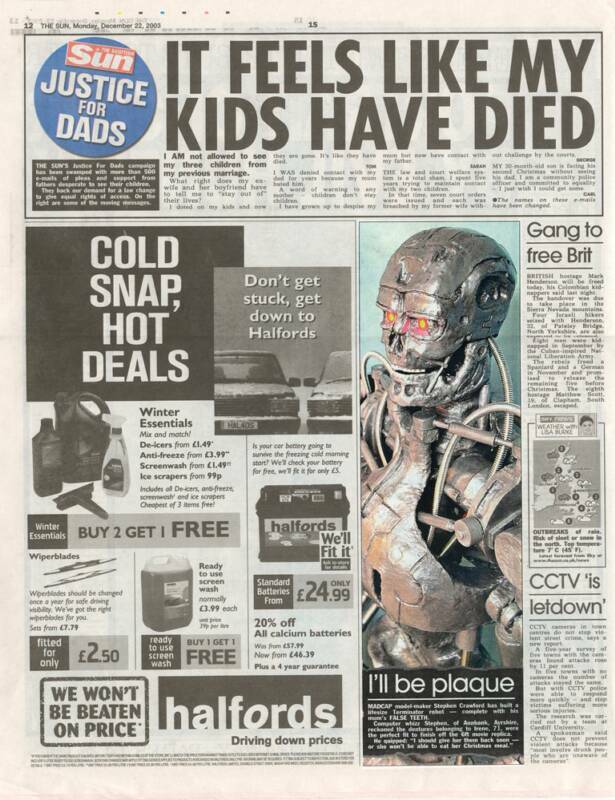 It's had a few other airings and was featured in three Scottish newspapers, but I can't imagine selling it now as it has pride of place in my spare bedroom... and is now showcased on the TerminatorFiles website. 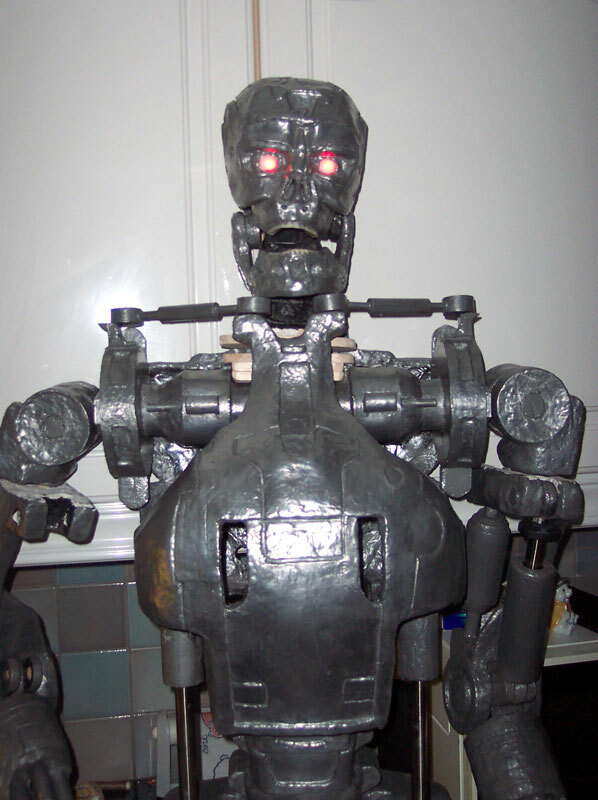 My interpretation of the Terminator took approximately 600 hours over 6 months and was constructed using a variety of materials. 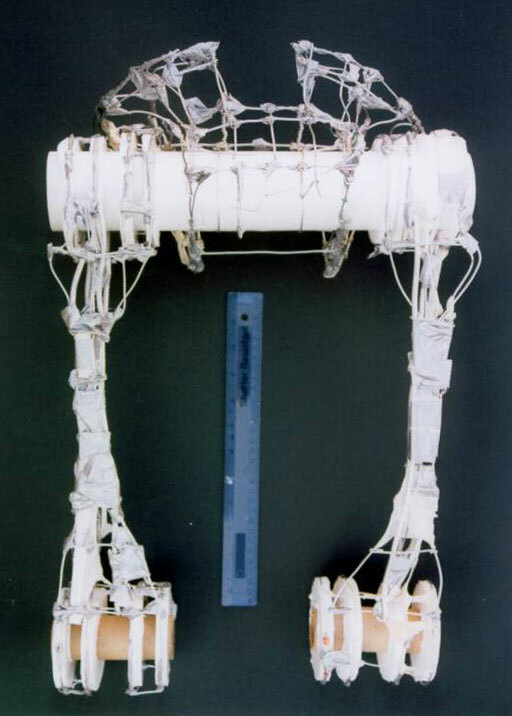 A wire mesh frame was covered with papier-mâché and then coated with a resin/aluminium mixture that simulates solid metal. 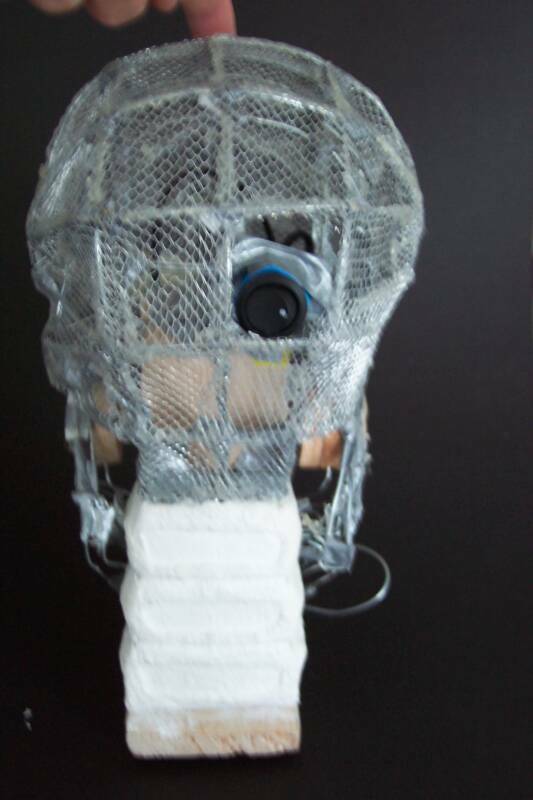 The head is radio controlled allowing head rotation and jaw opening/closing and the eyes light up with red LED's. 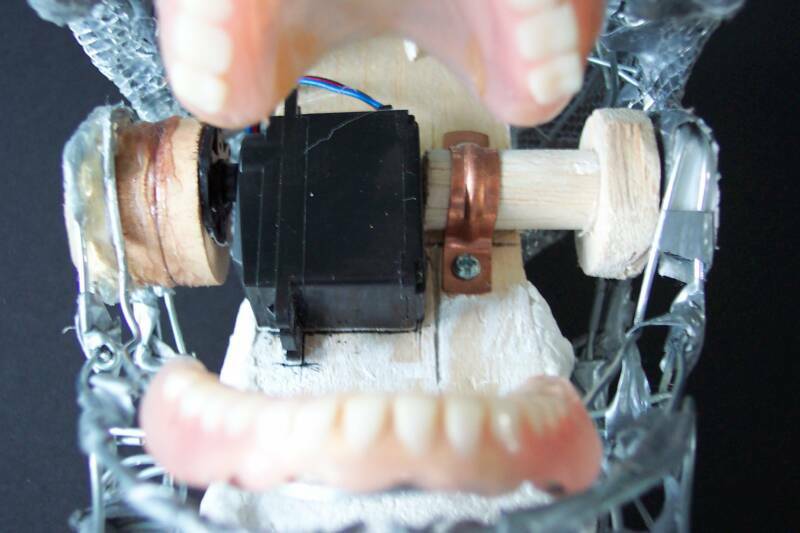 The finishing touch is a real set of dentures. I previously seeked a set from a dentist friend of mine, but he let me down. I couldn't be bothered making my own so I ended up using my mums (and no... the 'false teeth' kind, mind you ;). 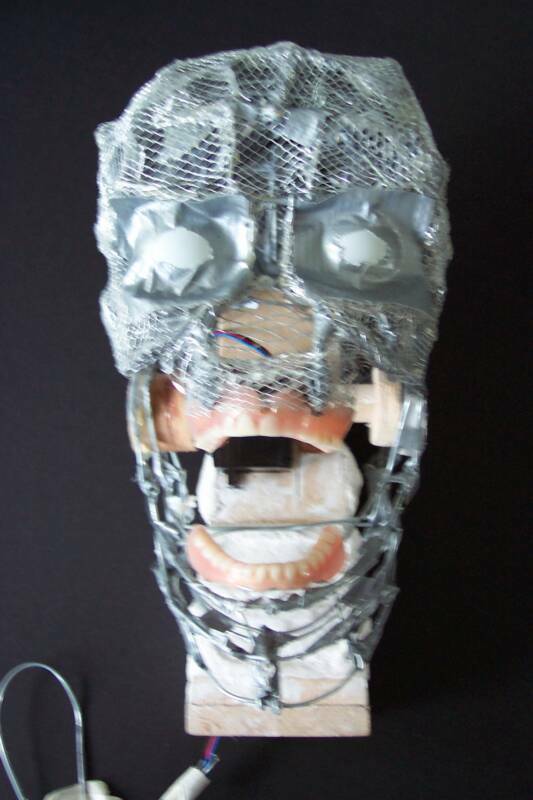 The infamous teeth attracted attention in the press and resulted in the Terminator being featured in Scottish local and national newspapers. It was funny at the time but in a way it did detract from the amount of work I put into it. 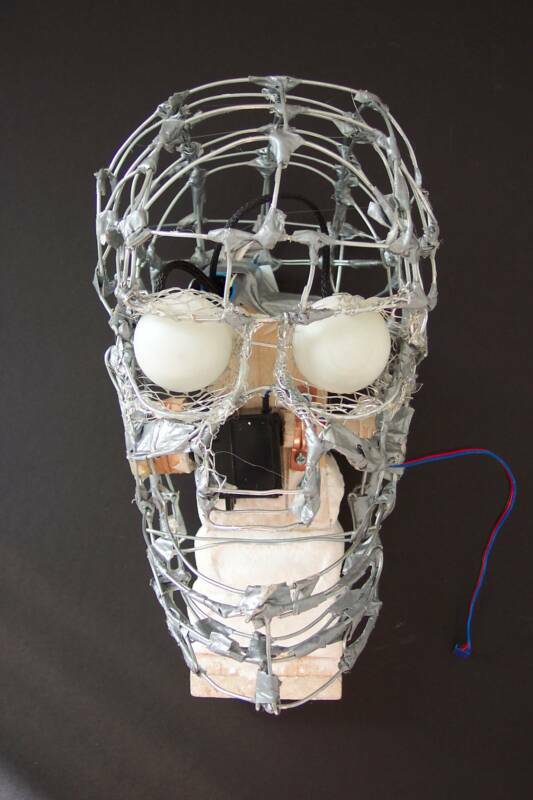 The methods described below outline the different stages of development and will give you an insight into the making of the life size model. 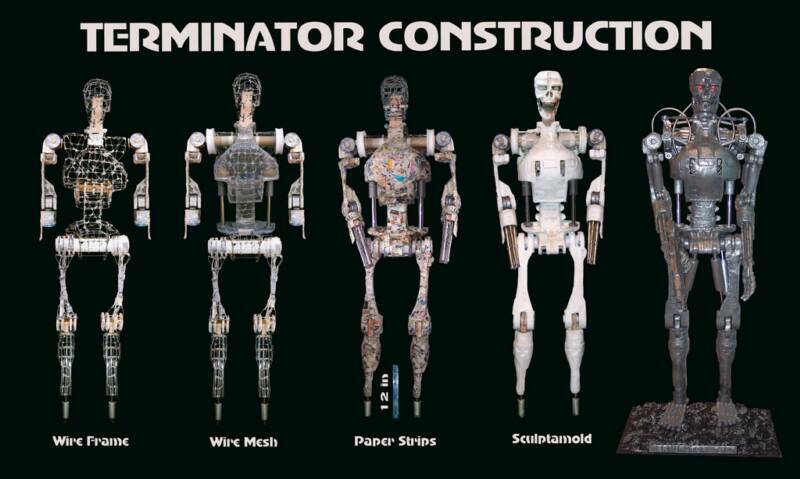 Before any construction took place, detailed sketches of the Terminator viewed from a variety of angles were prepared using photographs from books, web sites and video footage. 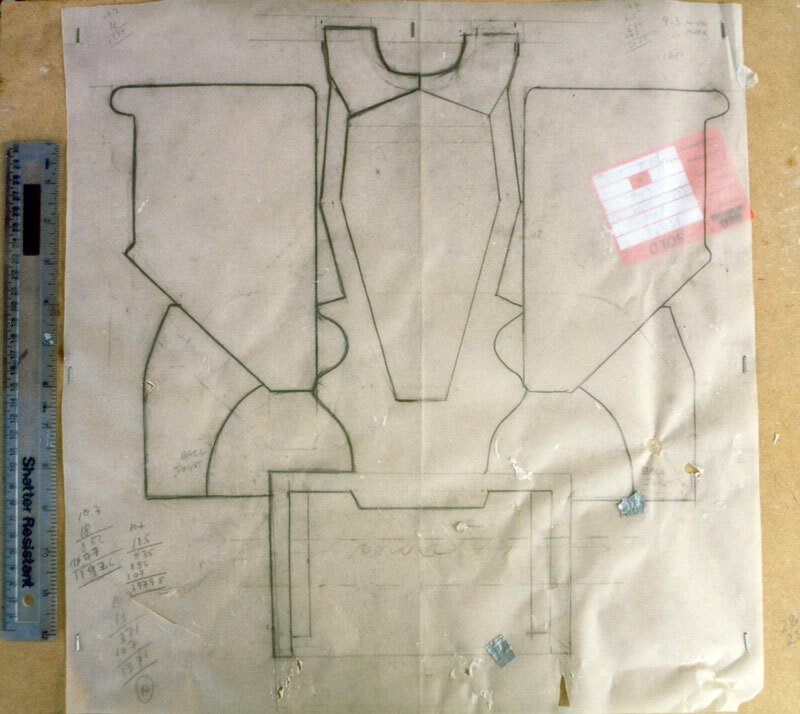 From these initial sketches full size drawings were made to act as templates for the wireframe construction. 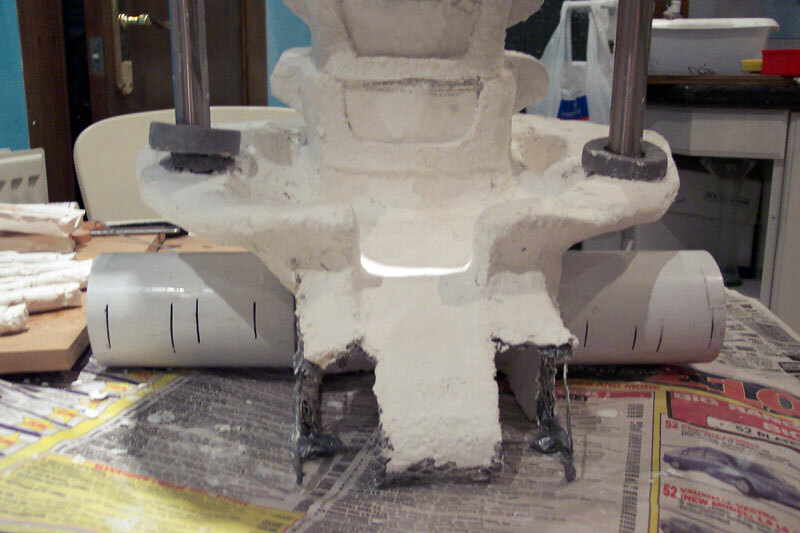 As the finished model would stand more than 6 foot high the construction was divided into several sections. 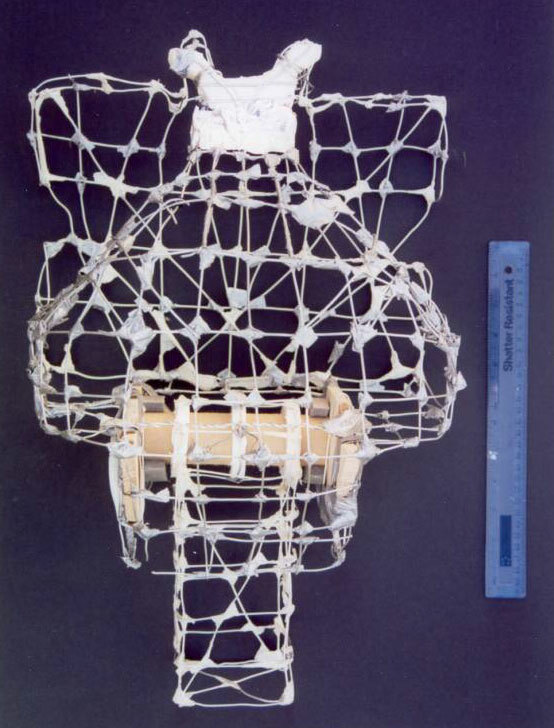 The chest was constructed using thin gauge aluminium wire, creating a lattice by criss-crossing many times to provide a stable and secure base for attaching wiremesh, papier-mâché and resin mixture. This was stapled to MDF thus forming a dome like structure with a flat back. The procedure was then repeated with all the other body parts. 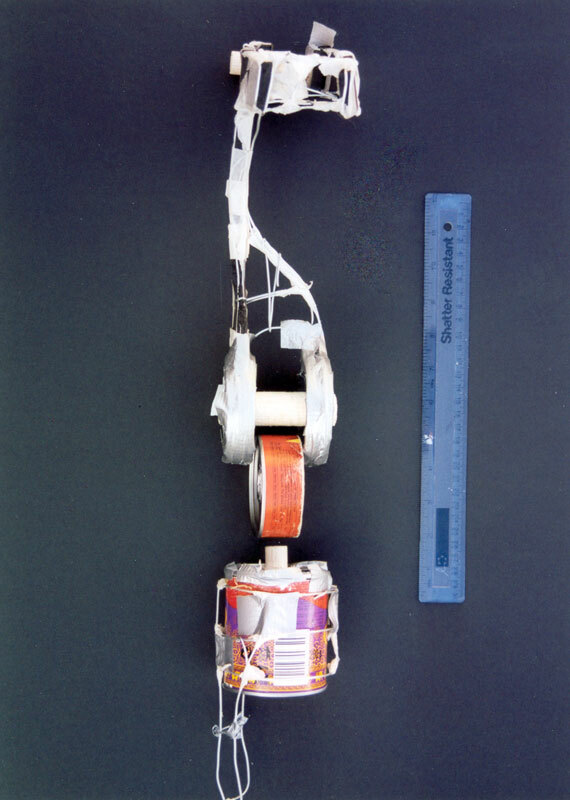 The arms were reinforced with potato crisp cartons cut to size while the legs had balsa wood sections inserted. 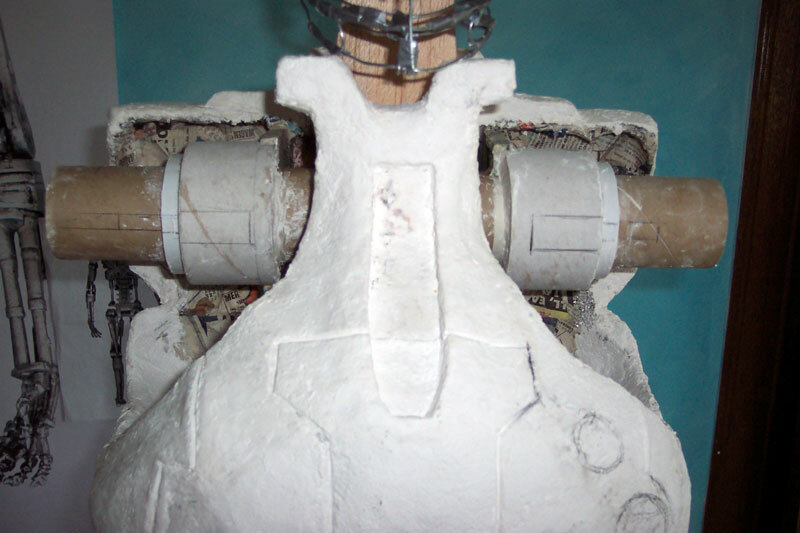 Once the chest and back were deemed stable enough they were joined together to form the upper body. 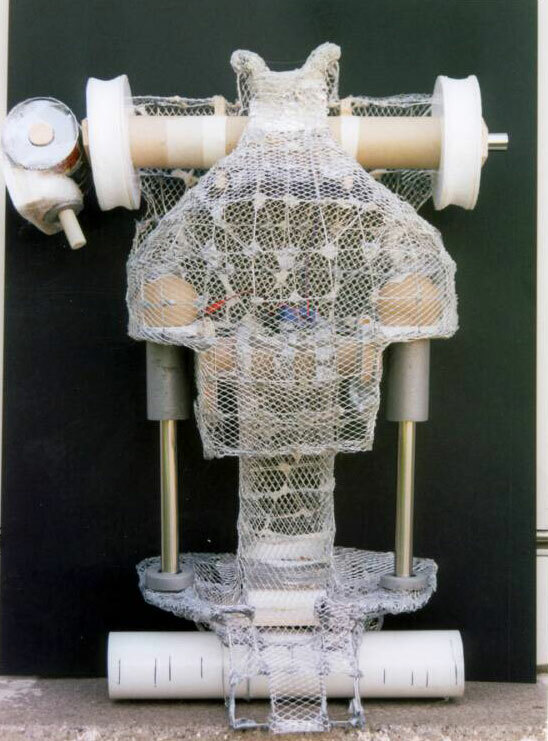 The wireframe skeleton was so crucial to the basic shape, scale and strength of the final piece that construction took about 200 hours. 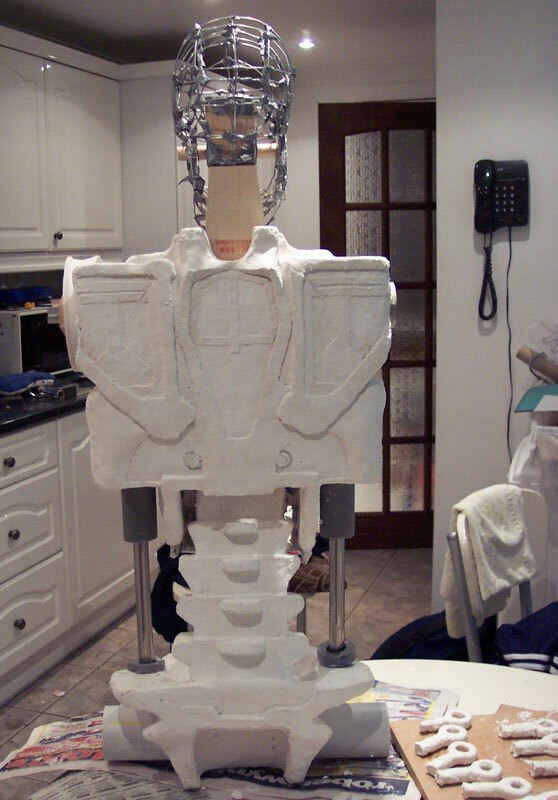 At this point the arms, legs, head, upper and lower body was still separate making the model easier to work with. 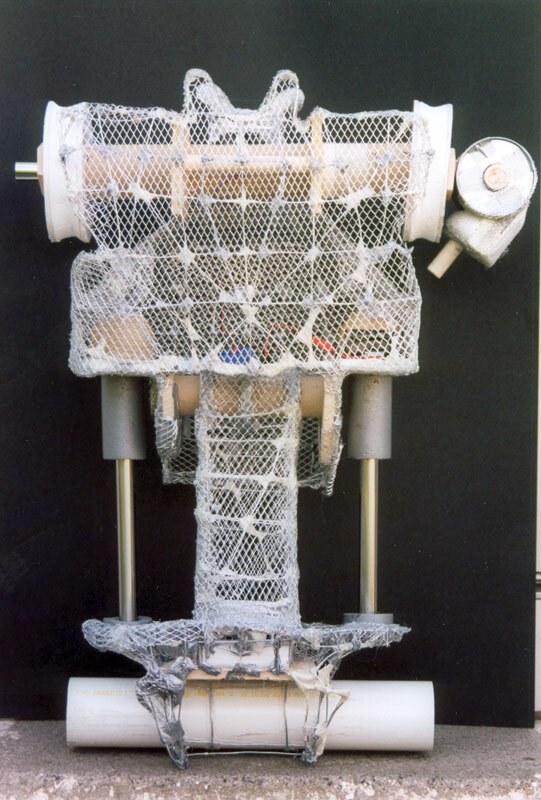 Wire mesh of different sizes was then wrapped around the various elements and glued using a hot glue gun. 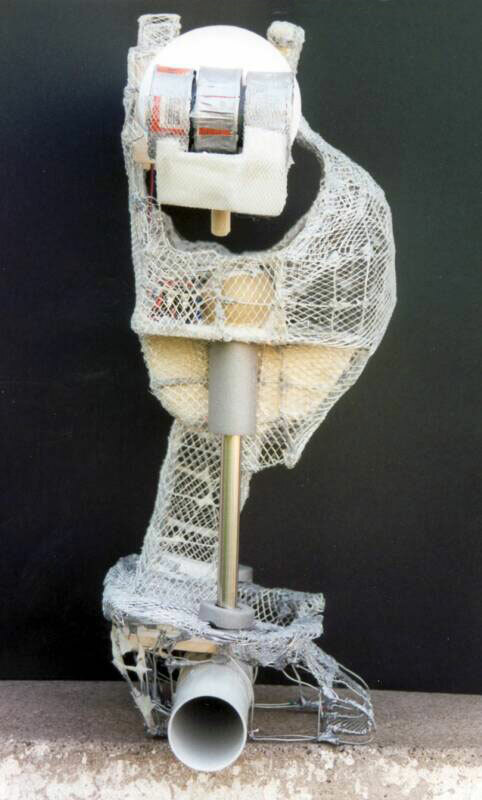 It was always my intention to make the model as light and strong as possible, as the skeletal legs would have to support the entire model. 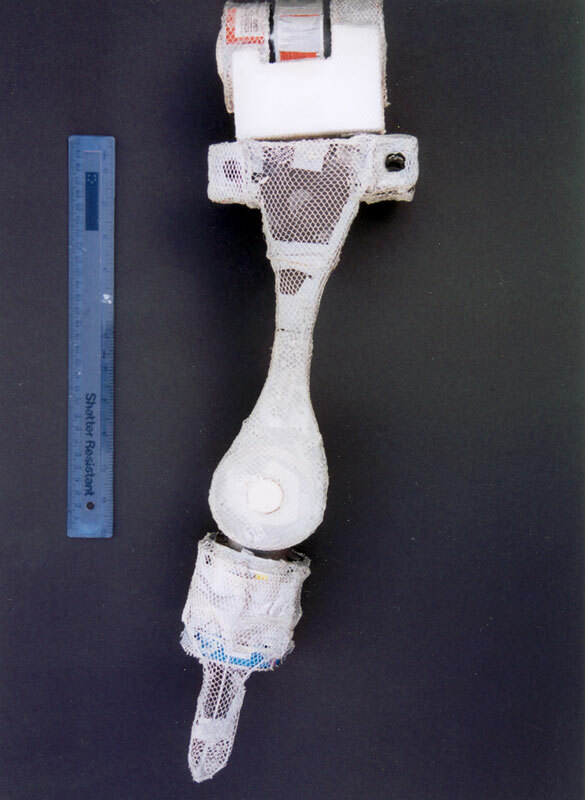 Before the next stage of construction plastic tubing was incorporated into the chest and pelvis areas to allow attachment of the arms and legs. 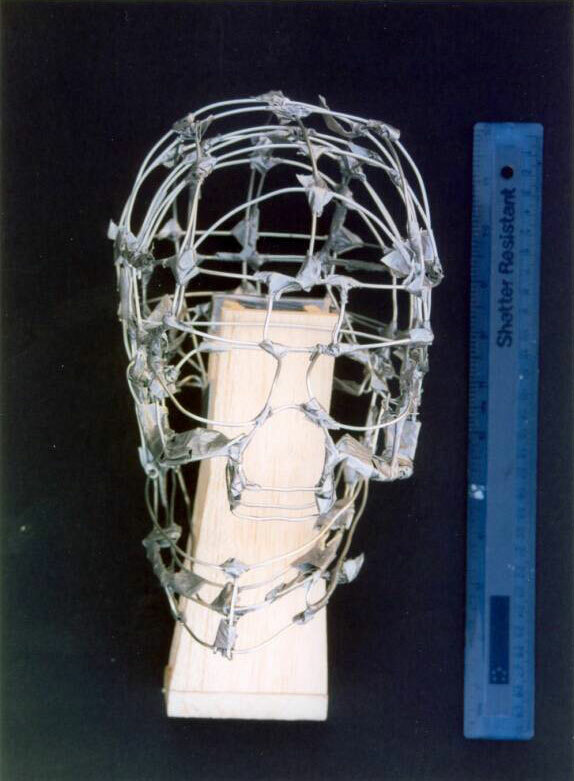 Before shaping the model with Sculptamold, paper strips soaked in PVA glue were pasted all over the wiremesh sections. 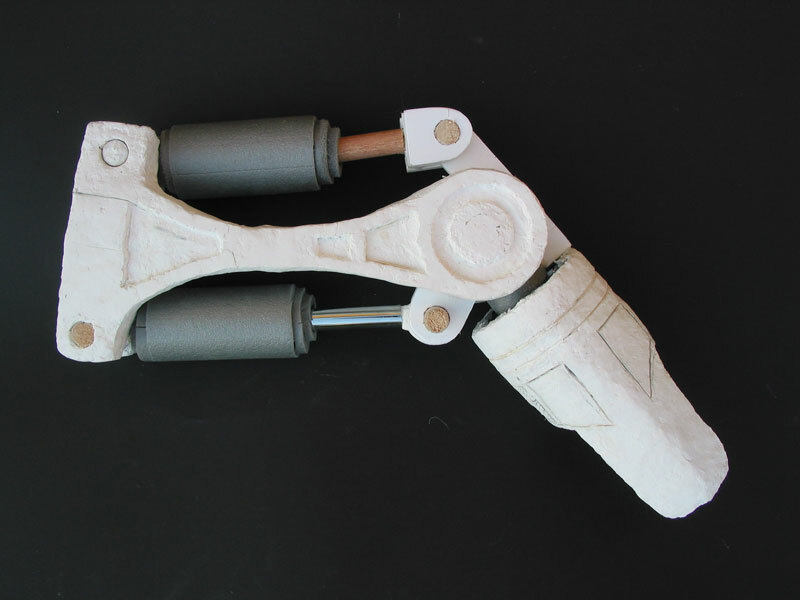 This acted as a support for Sculptamold and also enhanced the strength of the model. 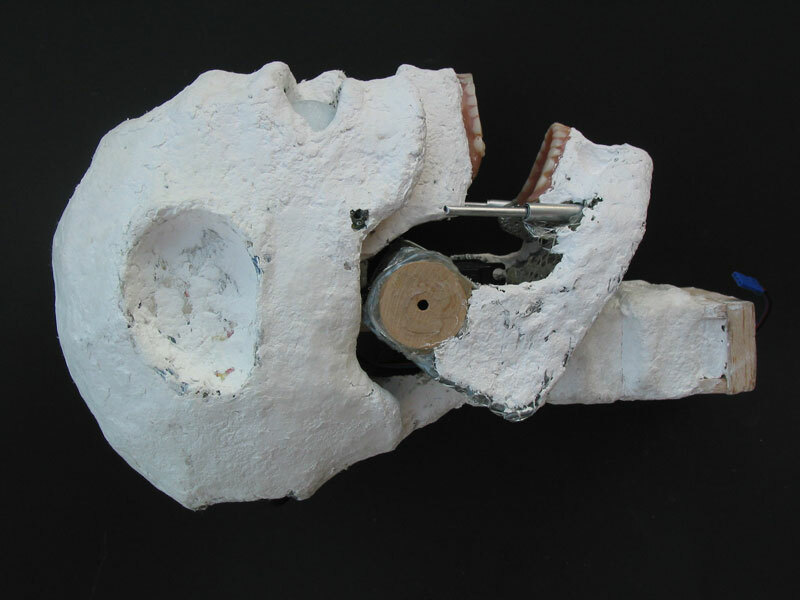 During this stage the pelvis and chest were joined together with the spine to form the upper body. The head, arms and legs were still separate at this point. 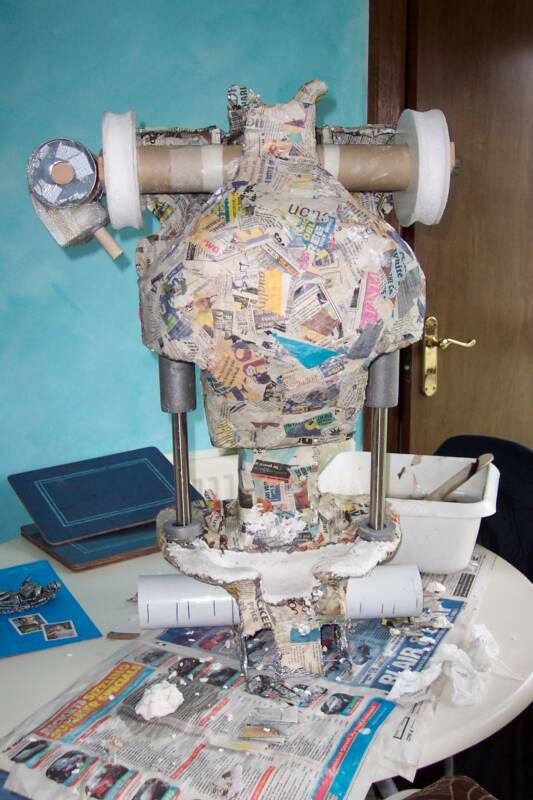 Once the paper strips stage was complete Sculptamold was modelled over each section. 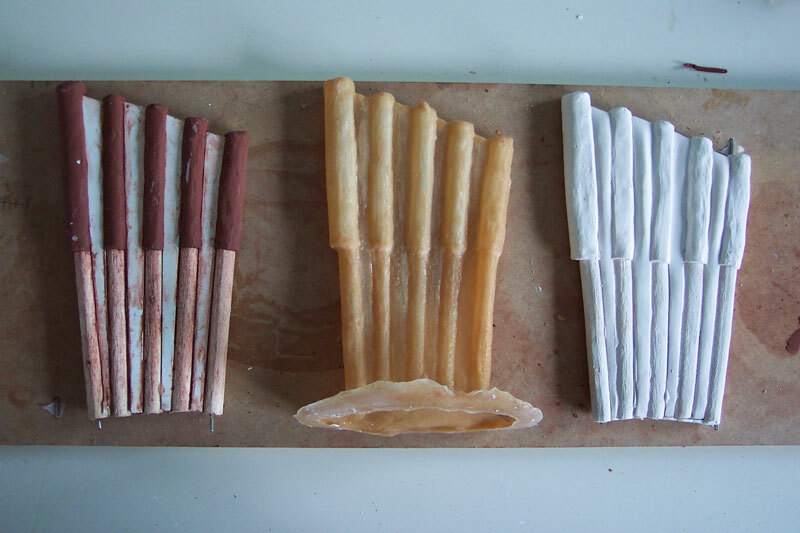 This material is a papier-mâché wood pulp product that is mixed with water, and can be modelled much like clay but is much lighter. 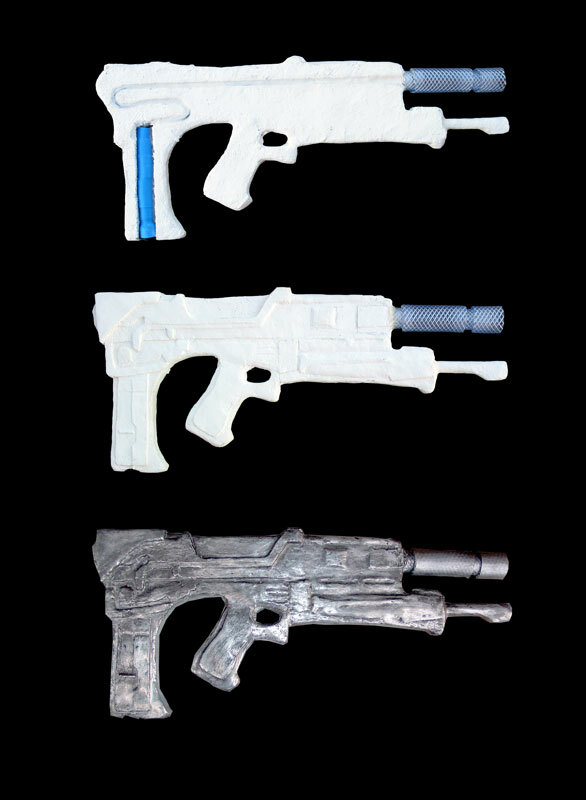 It can be manipulated for about 15 minutes so only enough material that can be modelled in that time is prepared. 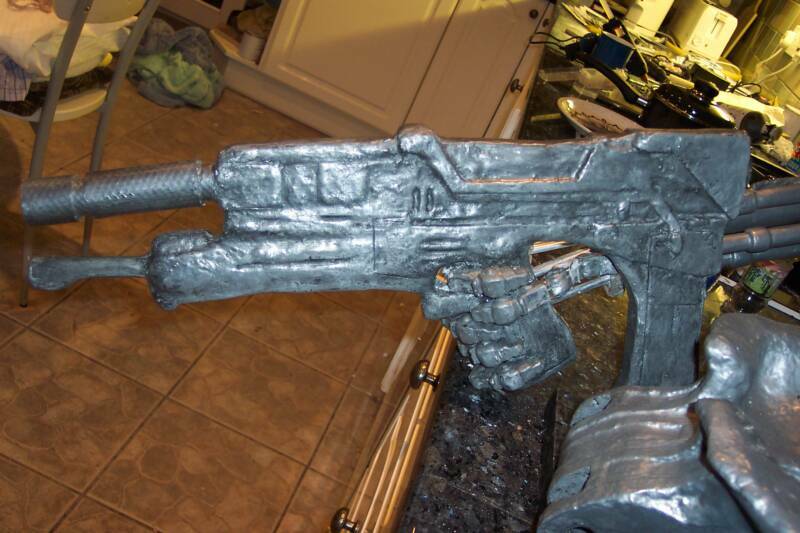 However it can be sanded and drilled when dry so any imperfections can be corrected later on. It takes a little time to get used to the amounts to prepare and how to handle it, but once mastered progress was fairly rapid. This was the first time I'd used it and was very pleased with the results. 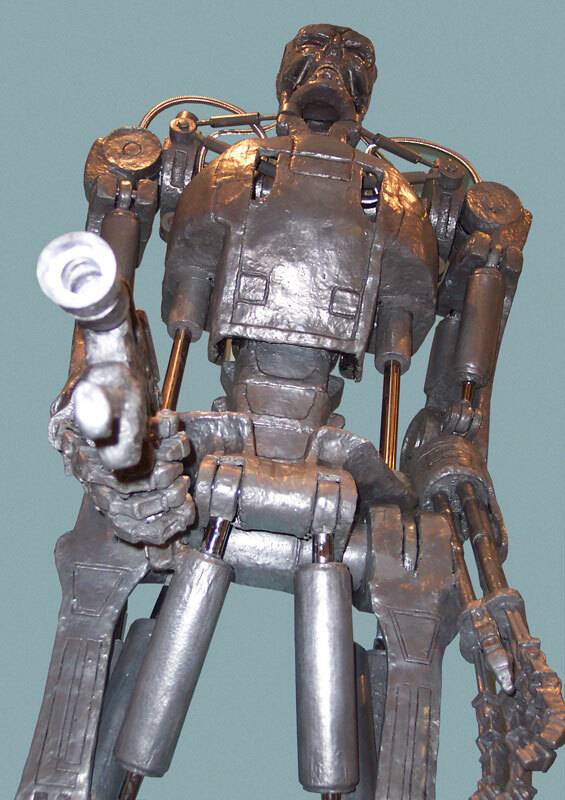 Now that the detail of the Terminator was being revealed it was at this stage I felt the model was starting to come to life. 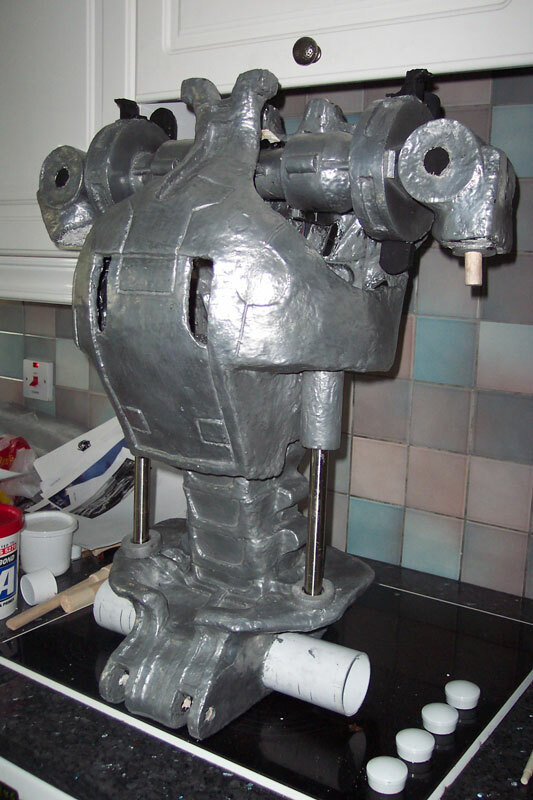 Once the Sculptamold dried and any corrections were made the whole model was painted with black gesso. 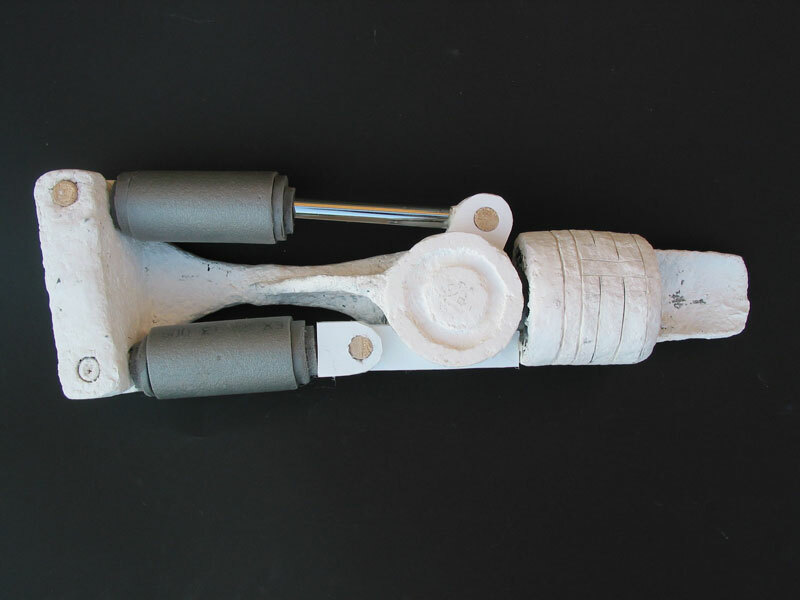 This provided a good key for the next stage and enhanced the finish of the resin/aluminium mixture and aided strength. 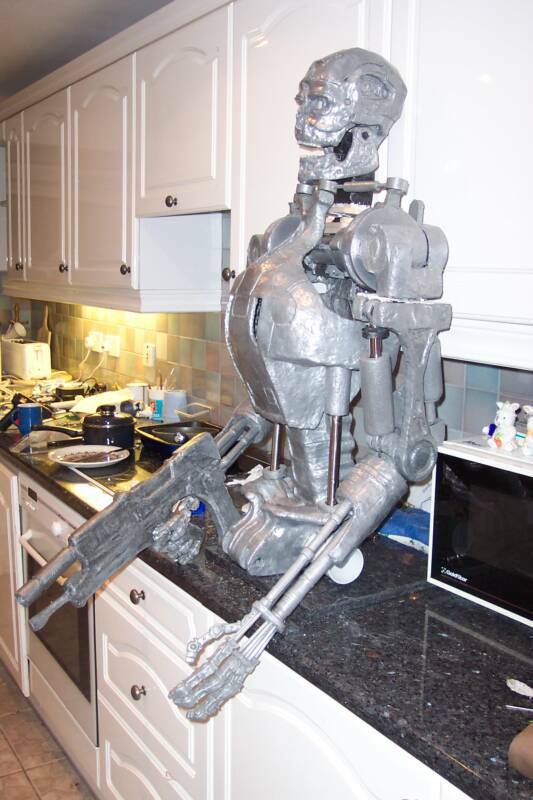 The finish for the Terminator provided one of the biggest headaches, as I had problems deciding what to use. I was never happy using silver and chrome like aerosol paints or aluminium foil, so I searched the web for an alternative. 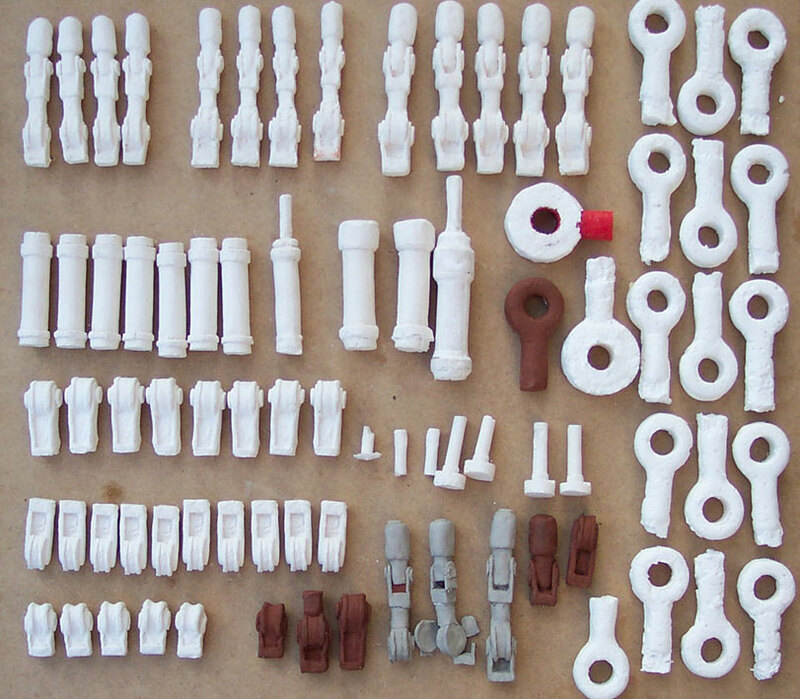 I finally discovered the Trylon range of materials and ordered some of their resin and aluminium dust. Once applied it was left to cure for a couple of days and then polished using Brillo pads. 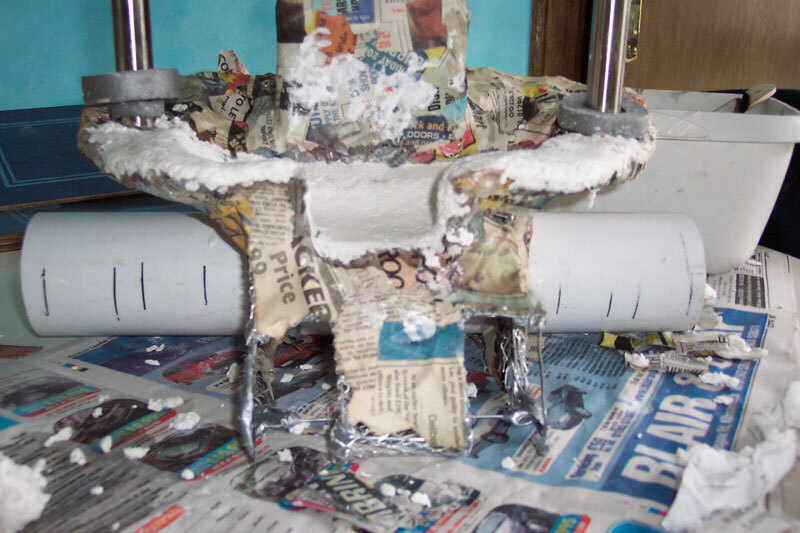 Finally the surface was finished using aluminium paste to complete the effect. 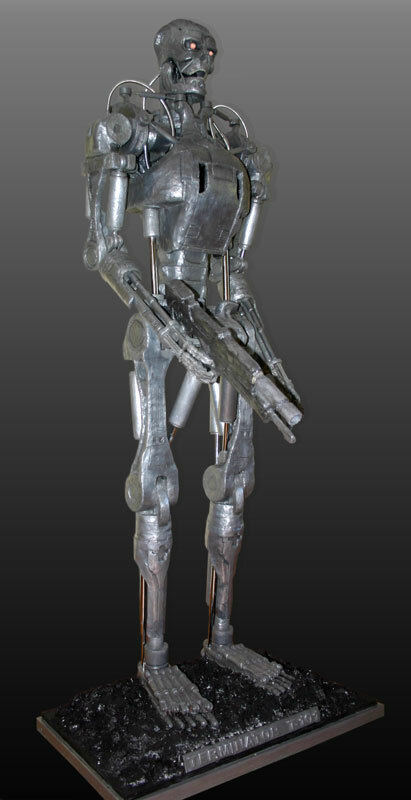 Although it didn't shine like chrome I was more than pleased with the effect, and for all intents it looked as though the model was made of metal but with a fraction of the weight. 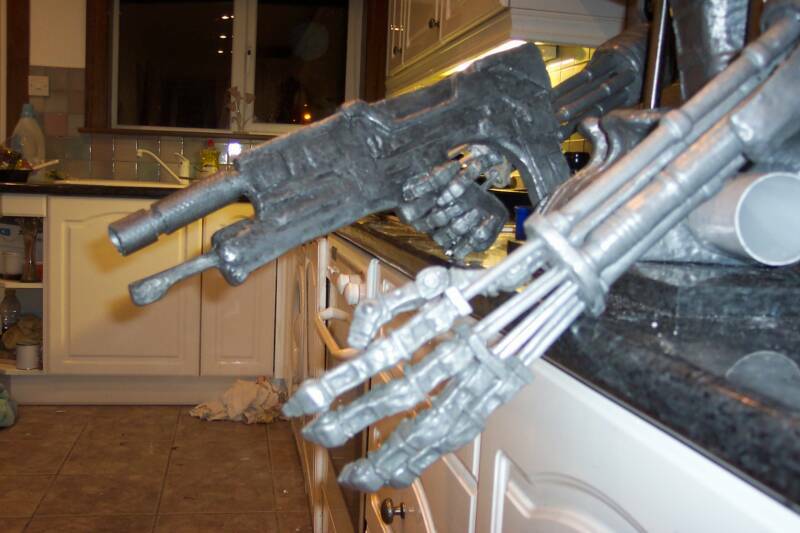 I always wanted the Terminator model to have some type of movement and initially I intended the gun arm to move up and down. 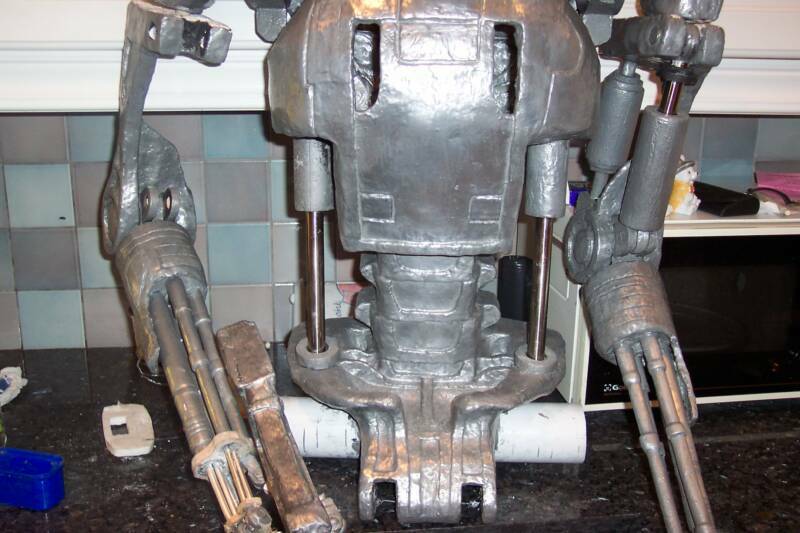 However the servos I had were not powerful enough and it would probably have made the model unstable anyway. 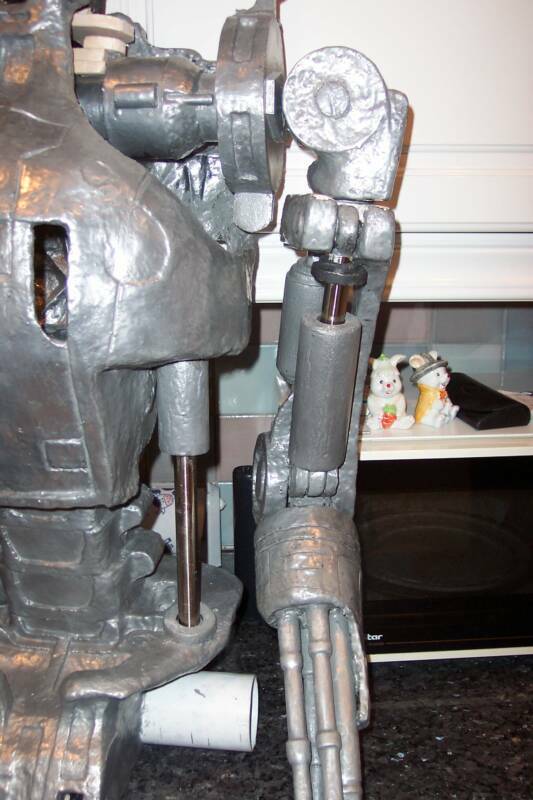 Rather than abandoning the movement theme I incorporated the servos to rotate the head and open and close the jaw. This operates by radio remote and adds interest to the piece. 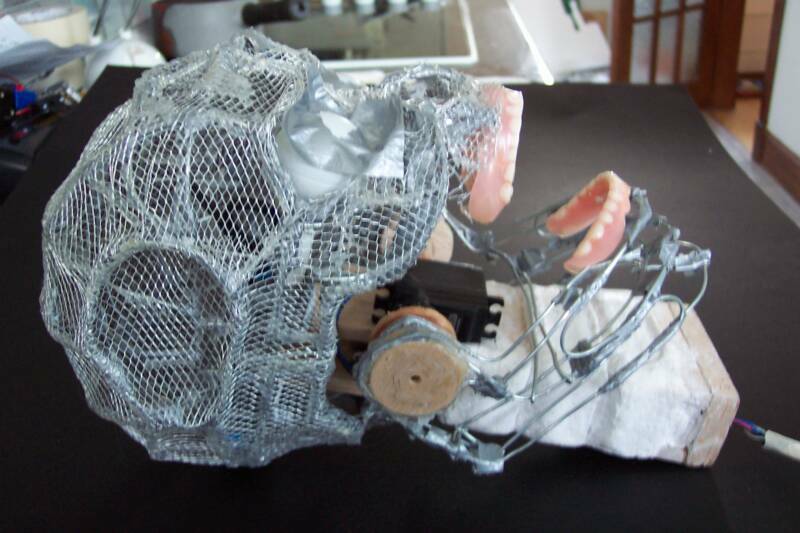 The use of my mum's dentures provided an organic look to the mouth and contrasted with the very mechanical and metal looking skeleton. 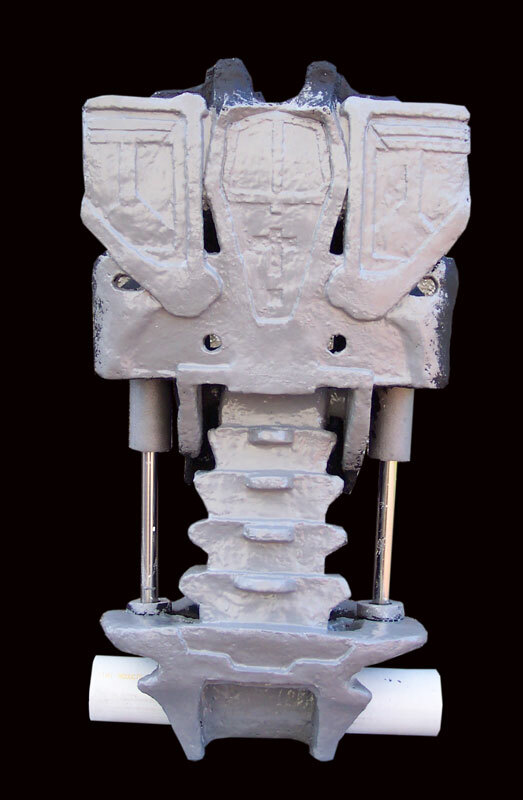 A fair amount of time went into the construction of the head and neck assembly to allow this movement, and the teeth became an inspirational touch as they attracted the attention of a couple of Scotland's national papers. 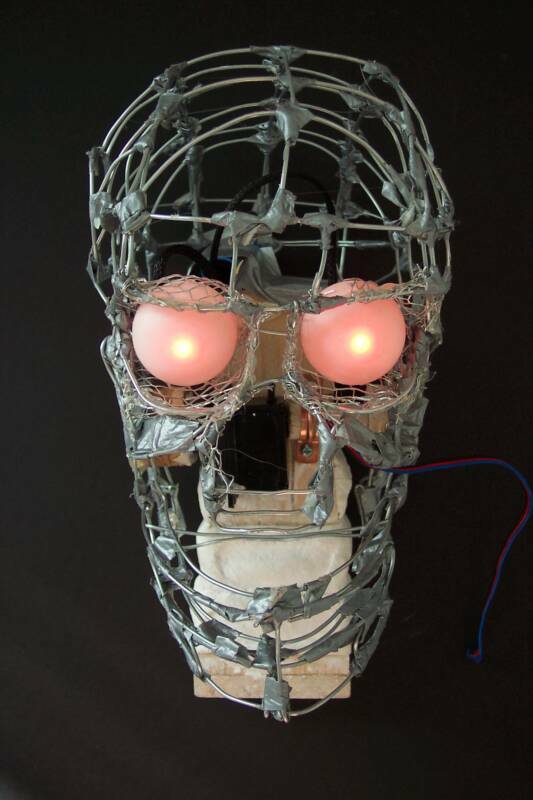 In addition I also felt it was vital that his eyes light up, so a friend prepared red LED's for me. These were placed inside Ping-Pong ball eyes at a pre-determined distance to create a diffuse glow around a brighter centre. 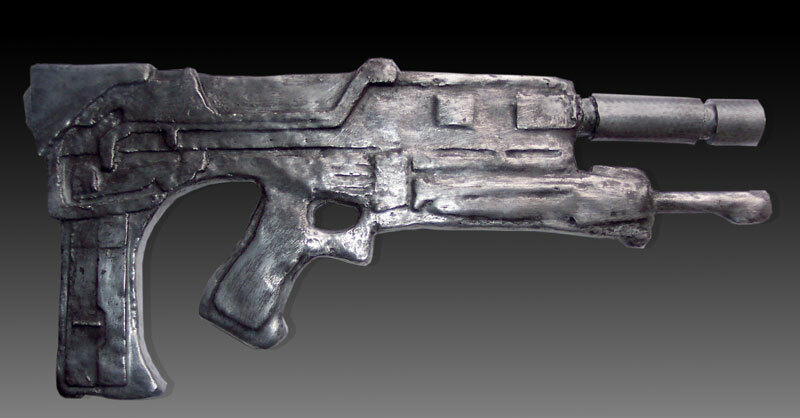 Similarly a blue LED was prepared to illuminate the rifle I created from polystyrene and sculptamold/resin/aluminium. 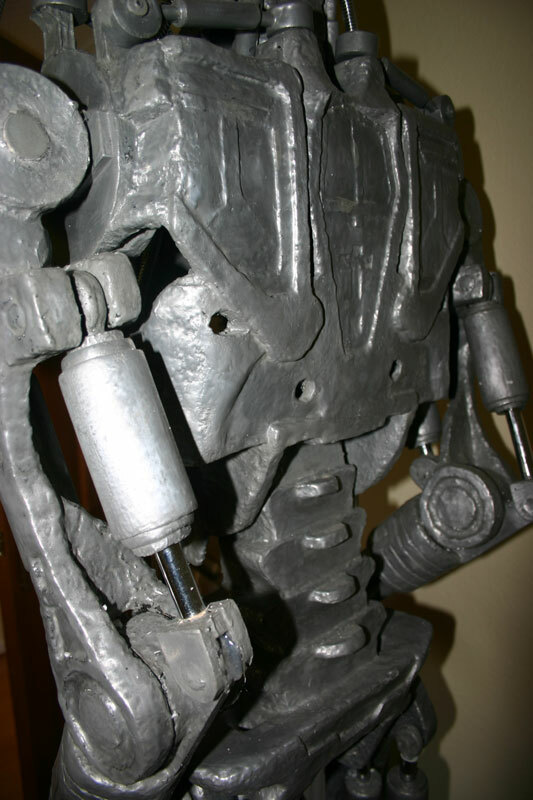 During construction many parts of the model were moveable manually including arm and leg bending, waist turning and upper body tilting. Ultimately it had to be fixed in the pose you see to enhance stability. This was one of the major disappointments of the build as the piston movements of the arms and legs was very neat indeed. 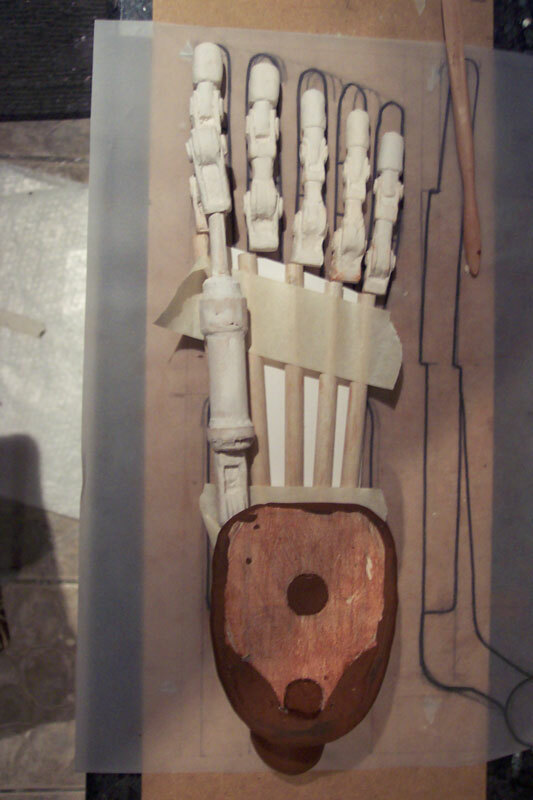 The hands and feet were a nightmare to construct due to the structure of the various digits etc. 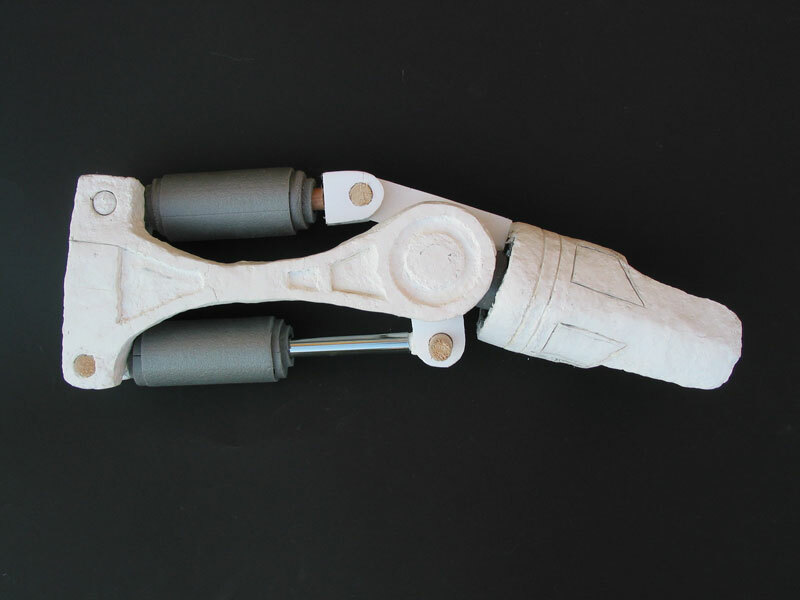 and the need to have extremely strong feet to support the weight of the model. 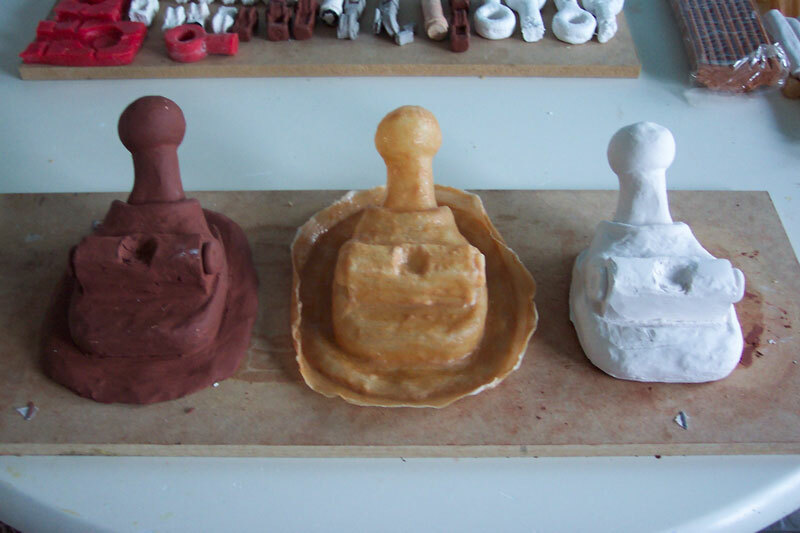 I created the various elements from plasticine or clay and made latex moulds so I could replicate them. 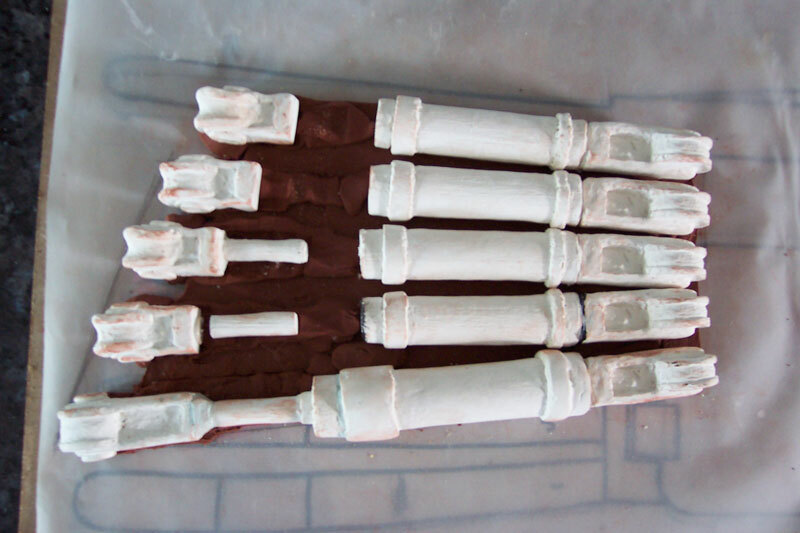 The feet were cast using Stonecast, a very hard and strong plaster while the fingers were made from ordinary plaster. 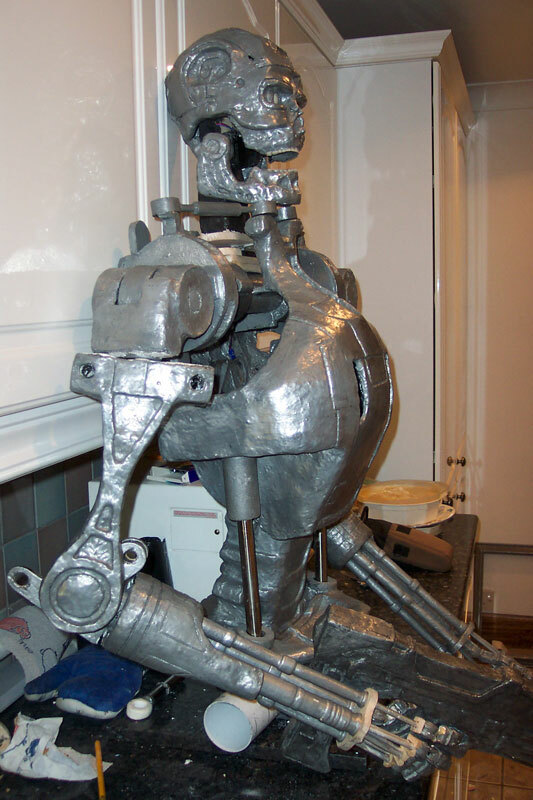 I was still worried that the legs and feet would be strong enough to support the body so I had to re-make stronger piston attachments where the legs meet the pelvis. 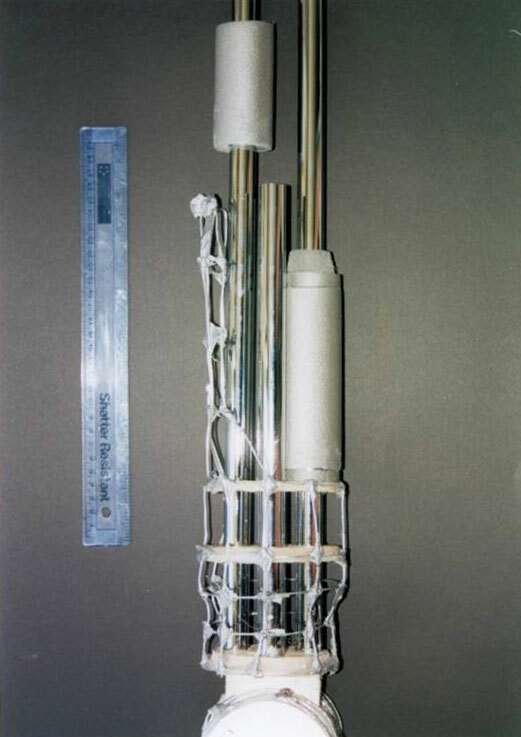 These were made using acrylic resin and were glued into tubular chrome cut to the correct length. 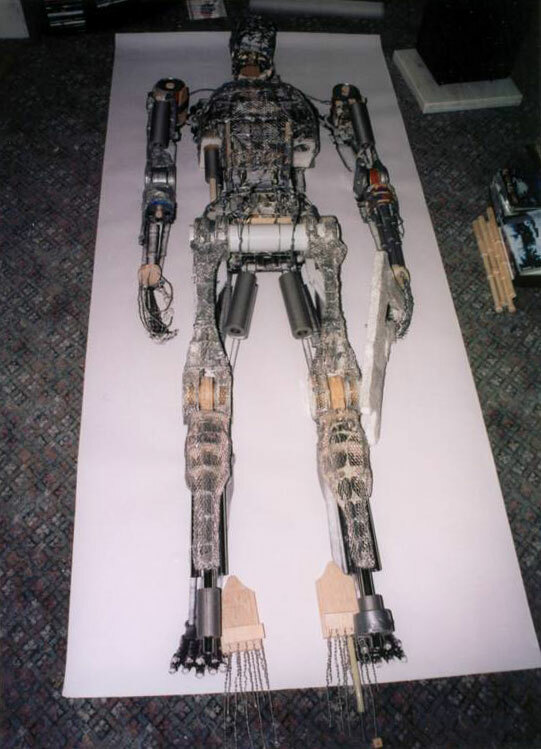 The reinforced legs proved to be sufficient to support the model and after a lot of effort The Terminator T-101 stood unaided for the first time. 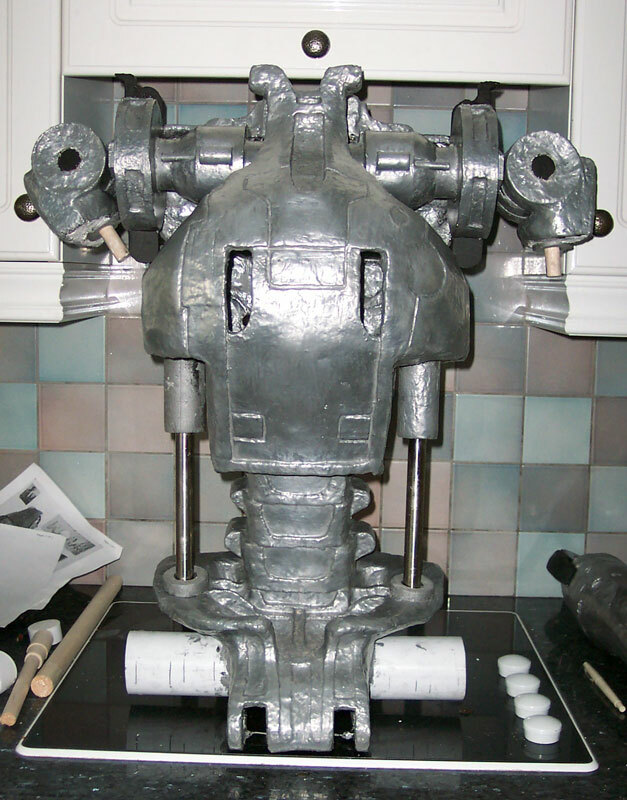 The finished model was now weighed around 30Kg so it required a sturdy base. 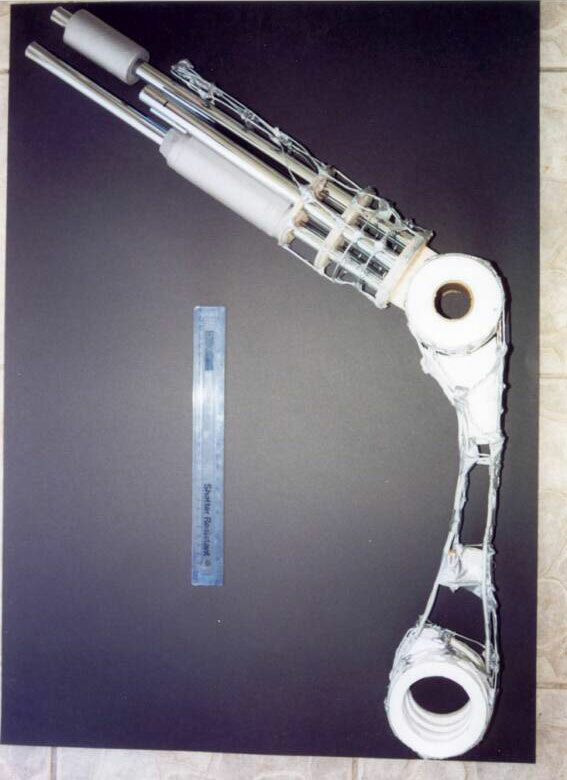 This was essentially layers of MDF with holes drilled to accept lengths of chrome tubing that were part of his lower leg. 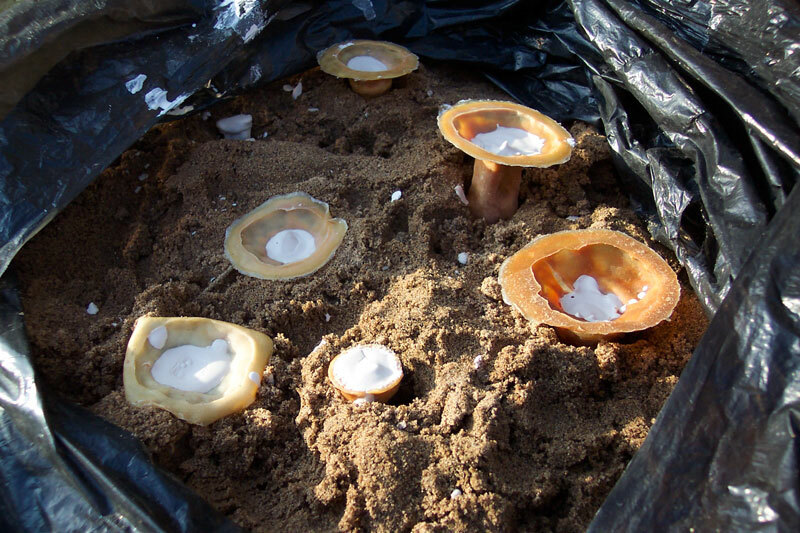 The base was finished with a mixture of polystyrene and Sculptamold spray painted lightly with black paint to give the appearance of burnt coal. 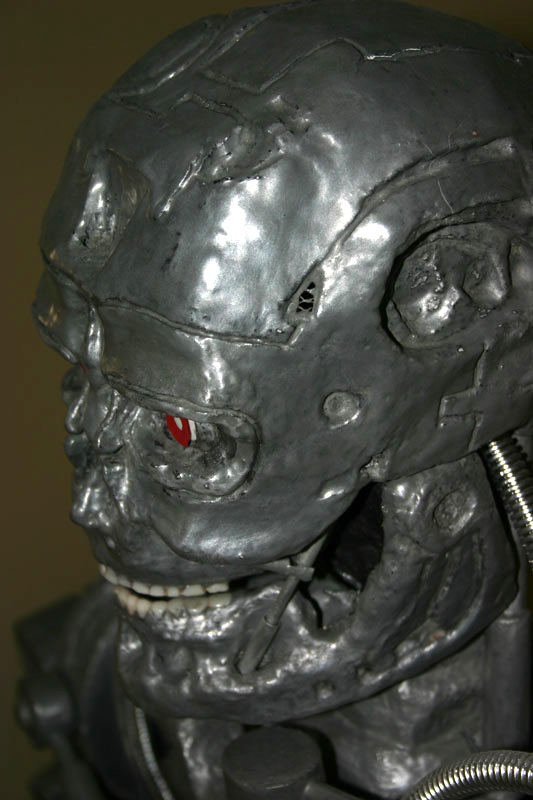 Finally a plaque with TERMINATOR T-101 was made from a mould using the same resin/aluminium mixture used in the model. I hope you all enjoyed reading the methods used in the creation of this project and that it might inspire you to try something similar. But be warned it can become addictive as I spent more than 600 hours on mine! I hope you think it was worth it ;). 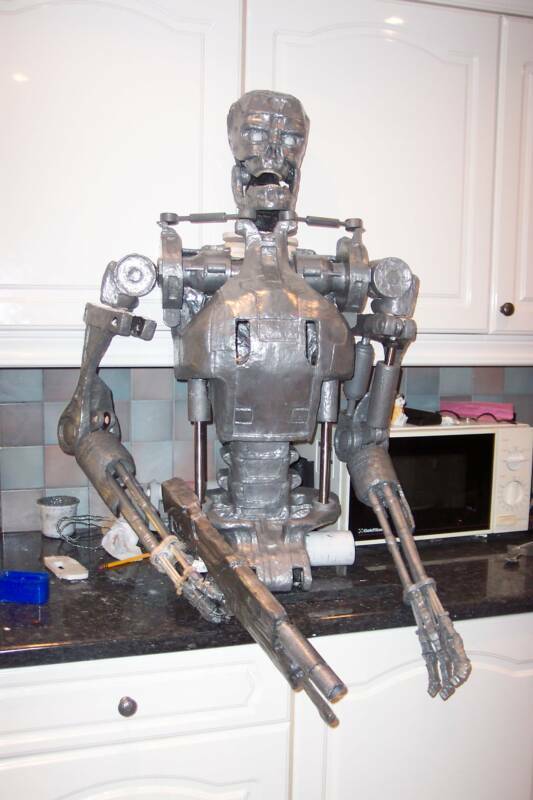 I built the terminator in my kitchen for lack of room elsewhere. As I was staying myself nobody could object. In the middle of night I was feeling thirsty and went into the fridge for a drink. 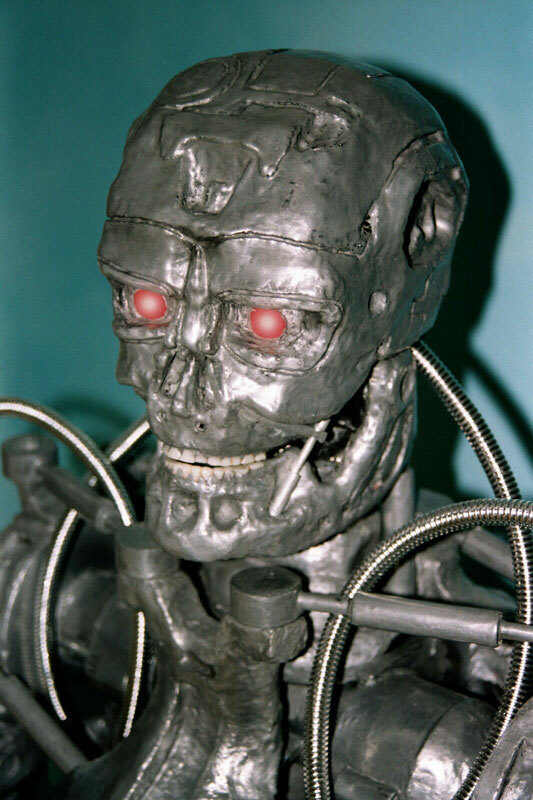 All of a sudden the Terminators head started moving and I nearly died of shock. I assume radio frequency interference from the compressor had activated the radio controlled servos. Never suspected that at 3am when half asleep. Think that's pretty stunning!!! My name is Stephen Crawford, formerly a food microbiologist, currently working in Information Systems as a support analyst. I live in Annbank, a small village near Ayr in Scotland. 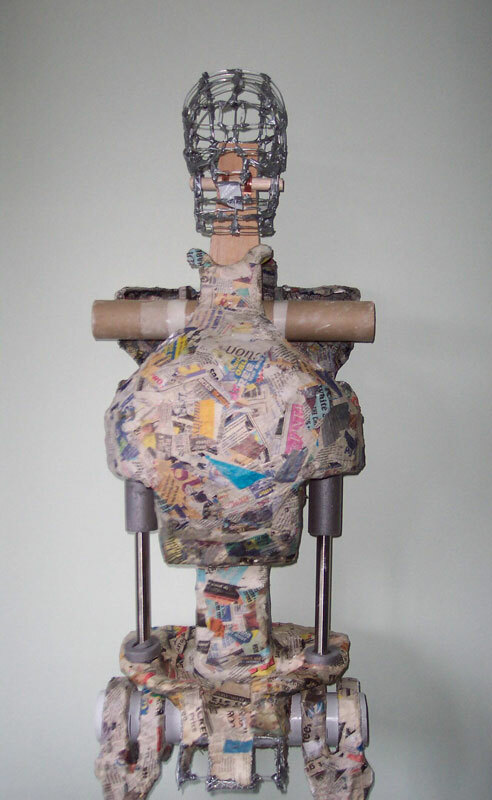 No formal art training except at school and first learned to use papier-mâché and plaster as a 10 year old and never forgot it. 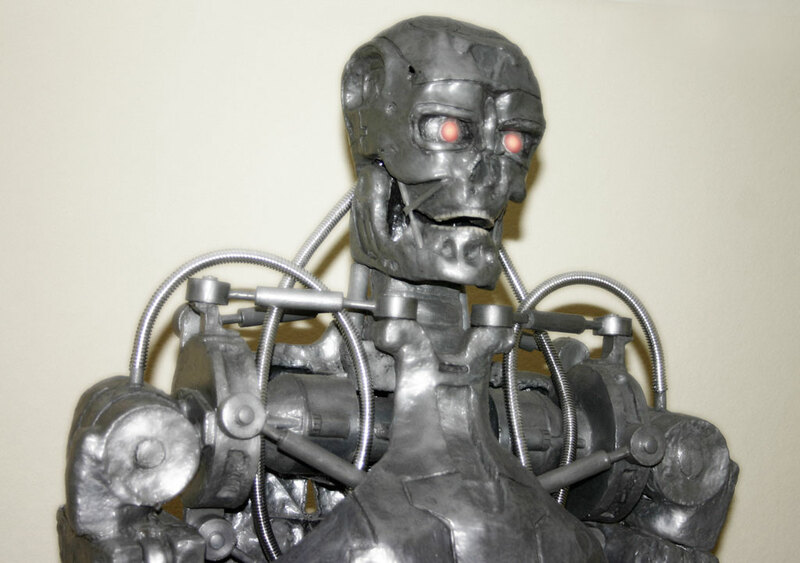 Miss Kerr was my teacher and she is long gone now, but she is the inspiration behind the Terminator. If only I had paid more attention to her I might have made a career out of art. I used to be a soccer, tennis and badminton fanatic but now prefers the lazy pursuits of sculpture, model making, hi-fi and photography. 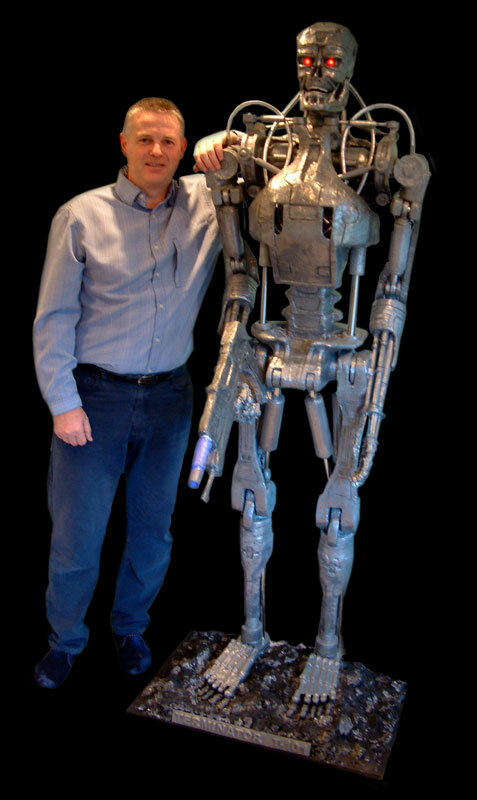 I've always been a lover of sci-fi and inspired by the movies Forbidden Planet, Star Wars, Blade Runner, Alien, Predator and of course Terminator. I'm a great admirer of the work of Ray Harryhausen, James Cameron (except Titanic), Stan Winston, Patrick Woodruff Jr./Alec Gillis and Tim Burton. Check out some of the progress images below!